This program changes what you type into a stylish font. Using Stylish Chat Font Changer you can change the text you are typing into "líkë tHí§ ýõü® të¤t ¢ãñ ßë ¢HãñGëÐ ã§ ýõü týÞë" and you can easily enable and disable this using a hot key or form taskbar icon. 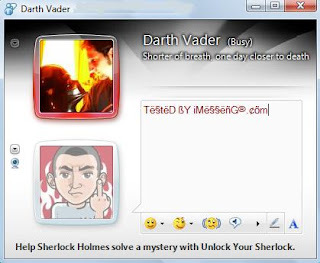 Stylish Chat Font Changer is a freeware and it's compatible with all IM clients and Windows OSs.